Florianopolis, the capital of the Brazilian state of Santa Catarina, evokes tropical beauty through its mellifluous name alone. Boasting an enviable quality of life and some of the most desirable coastline in Brazil, the city is a natural fit for the kind of intimate experience you’ll find at Quinta das Videiras. 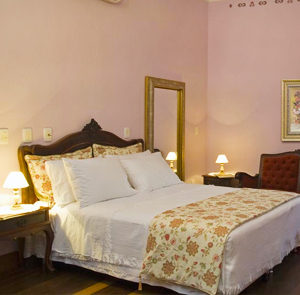 This boutique hotel replicates the style of a 19th-century Portuguese residence, right down to the deep pink façade and surrounding grapevines. 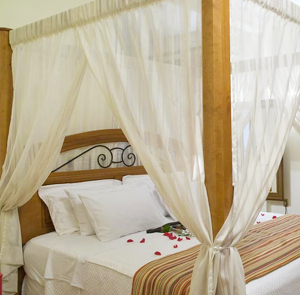 With only eleven rooms, guests can expect personalized, attentive service. The wooden furniture has a rustic feel, with throwback comforts like oversized wardrobes and four-post beds banishing any thought of rowdy spring-break vibes, despite the nearby surfing mecca, Mole Beach. At the top of the guest-room food chain, the loft suite features two bedrooms, a private mini-pool, and an outdoor barbecue. Couples on a romantic getaway might consider the master suite, where they’ll find an assortment of bath salts and candles waiting for them. Bathrooms are one area where retro is less than desirable, and here they’re a welcome fast-forward into five-star modernity, with dual sinks, handheld showerheads, and sliding glass doors. In a nod to local tradition, guests who place an order the night before wake up to an in-room Portuguese breakfast served on blue porcelain. 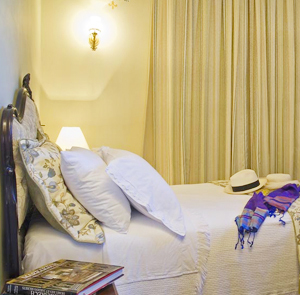 While Quinta das Videiras is miles more sedate than the larger resort hotels, its proximity to the Lagoa da Conceicao — the lagoon in the center of the island — situates it within easy walking distance of the city’s vibrant nightlife. Please note: Children under 12 years of age not are not permitted. 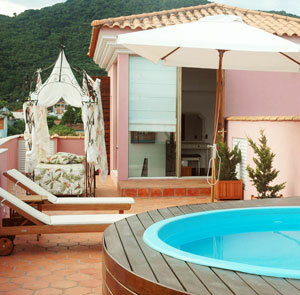 Hotel Boutique Quinta das Videiras is located about 20 min drive from Florianopolis' Hercilio Luz International Airport. Transfers can be organized for R$50 each way. Please contact CustomerService@TabletHotels.com for assistance with airport transfers.